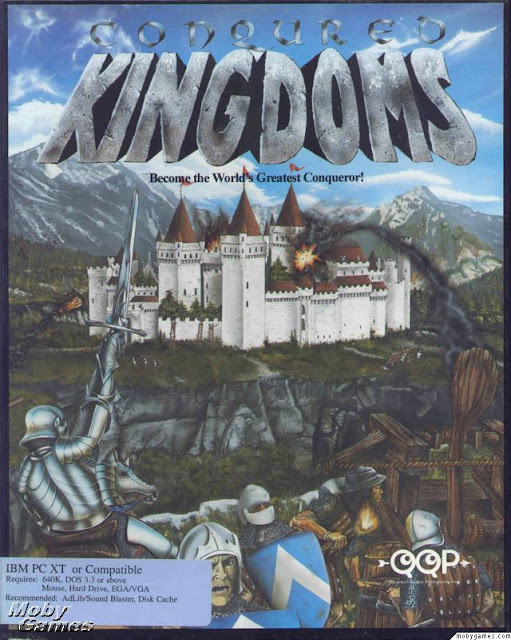 Conquered Kingdoms is a turn-based strategy game released by QQP in 1992. 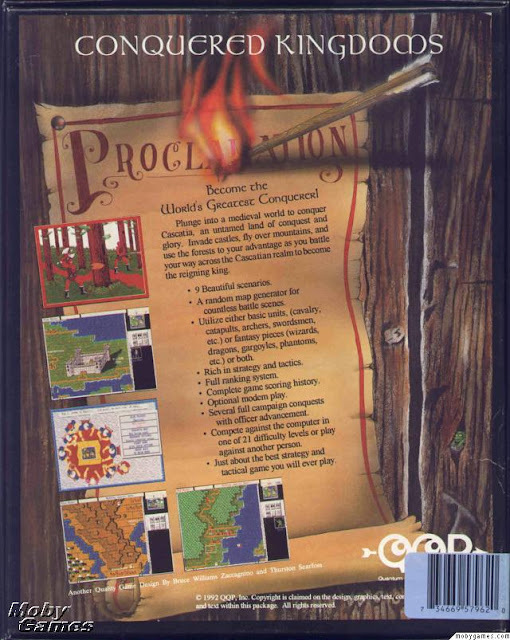 The game followed QQP's other successful turn-based games like The Perfect General and The Lost Admiral by offering innovative, extremely enjoyable gameplay, solid AI and basic, functional graphics. 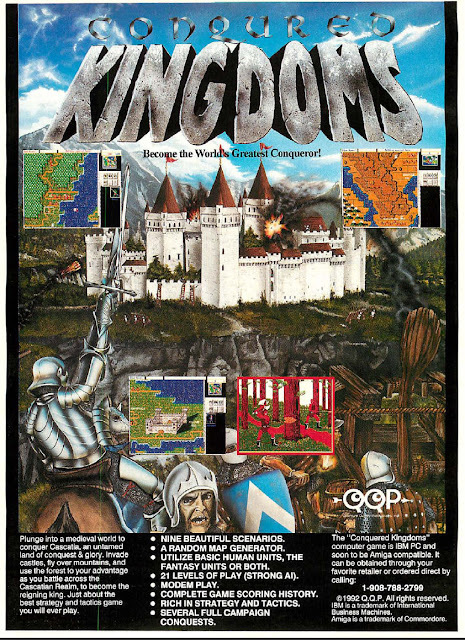 This game was clearly influenced by classic boardgames like RISK and earlier computer wargames like Warlords, Empire and QQP's own releases, yet Conquered Kindoms manages to present a totally unique combination of elements; resource collection, unit combat, castle siege, etc that haven't appeared together in a game since. 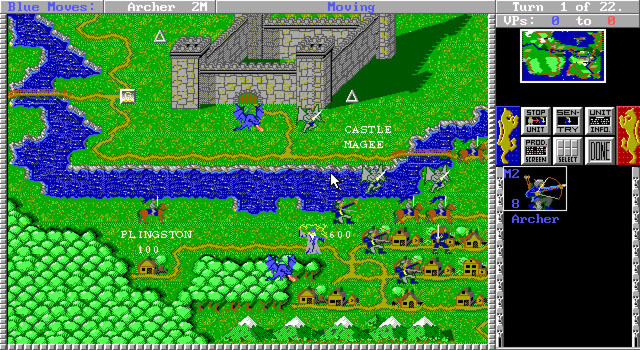 Probably the closest similar games would be those of the Heroes of Might and Magic series. Sadly only a month after Conquered Kingdoms was released in November of '92 Westwood Games released the classic Dune II, a game which created the modern real-time strategy genre, spawning dozens of similar games and relegated turn-based strategy gaming to an uncertain future. To play Conquered Kingdoms you'll need the DOSBox DOS emulator and the game files themselves which you can get here at Home of the Underdogs(it's the .ZIP file). Previously unavailable FULL manual here. 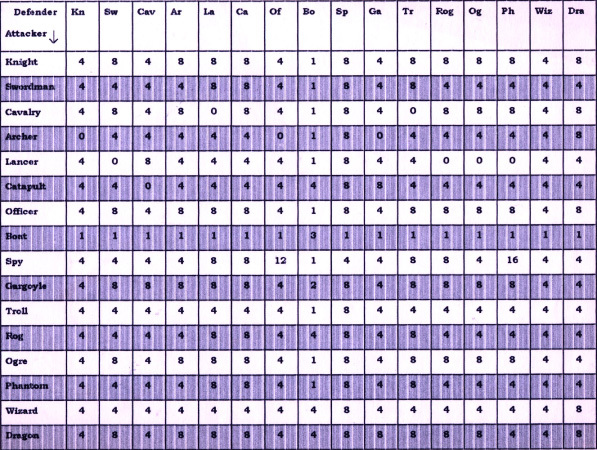 Unit combat interaction chart here. IMPORTANT: You'll also need a special mouse driver that you can download here. Extract MOUSE.COM and put it in your Conquered Kingdoms game folder. 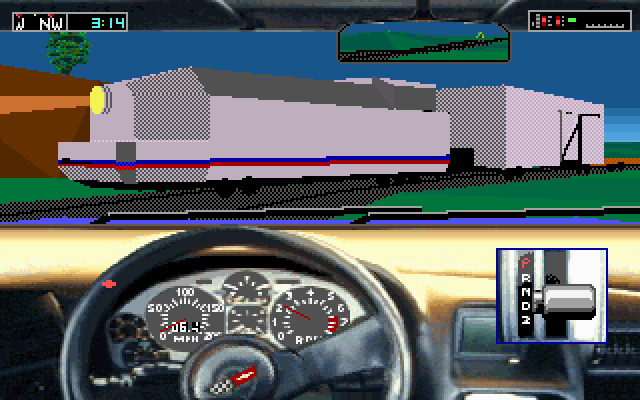 Run the game by mounting the game folder in DOSBox and then type "MOUSE.COM" to run the mouse driver, and then type "CC B" to start the game with the Soundblaster sound option. There will be a copy protection prompt but just enter any series of keys followed by ENTER three times to get by this. 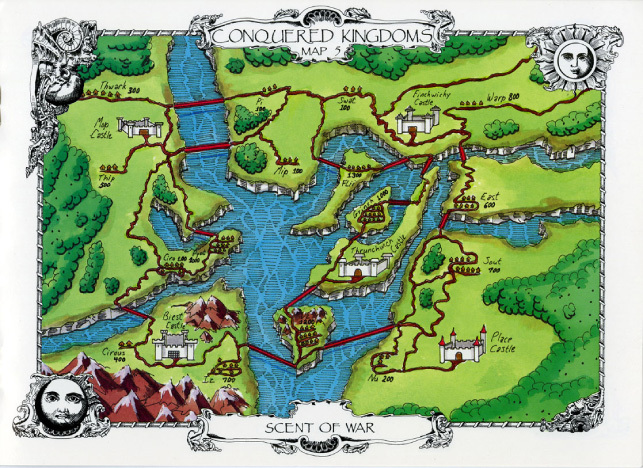 The goal of Conquered Kingdoms is to have more Victory Points than your opponent at the end of the game. You gain VPs by capturing towns, cities and castles and you do this by fighting the enemy and occupying these points with your various army units. 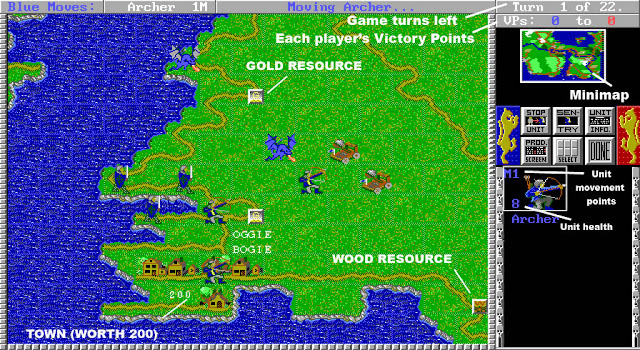 Before each game you buy an army with your initial gold supply, and after the game starts you can purchase new units using Resource Points(Gold, Coal and Wood) that you collect by occupying the RP points scattered throughout the map. 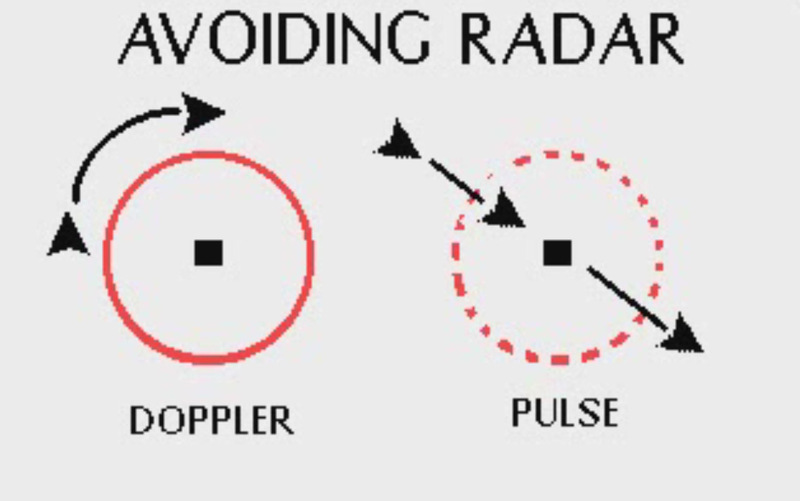 Unit movement is fairly simple; right-click on a unit and then left click a destination square. IMPORTANT: Make sure not to place more than 2 friendly units on a single square or you might lose your units(max units per square is 2 friendly 2 enemy). Combat happens in a seperate turn-phase. Each unit in the game has a different effectiveness versus enemy units, and many powerful units can be killed using simple cheap units(ie: archers killing dragons) so careful planning is required. 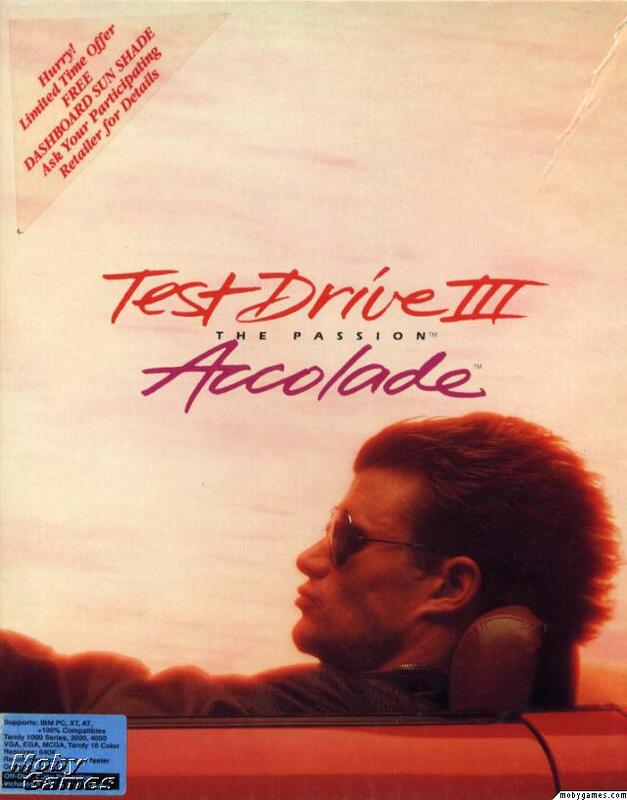 Test Drive III: The Passion is a driving game released by Accolade in 1990. 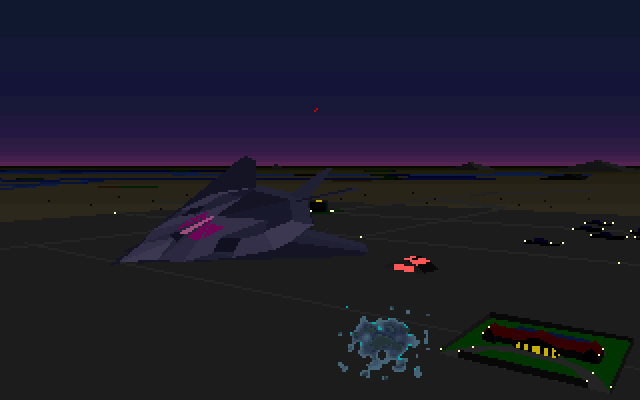 It's a sequel to of 1989's Test Drive II: The Duel and it generally follows the standard Test Drive formula of driving exotic cars and fleeing from the police, except instead of 2D sprites the action in TD3 now takes place in a fully 3D world. The game was a HUGE step forward in open world game design, with trains and traffic that followed realistic patterns, realistic weather effects and even hidden areas that waiting to be discovered. 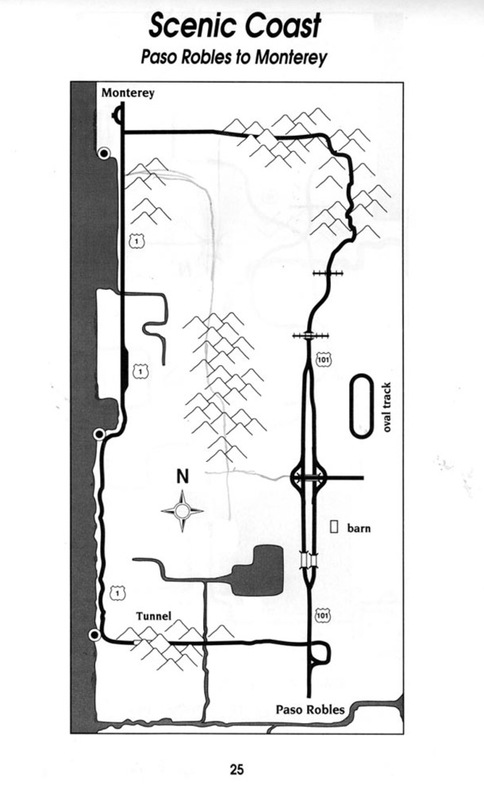 In TD3 it was now possible to choose from multiple routes and even race offroad. 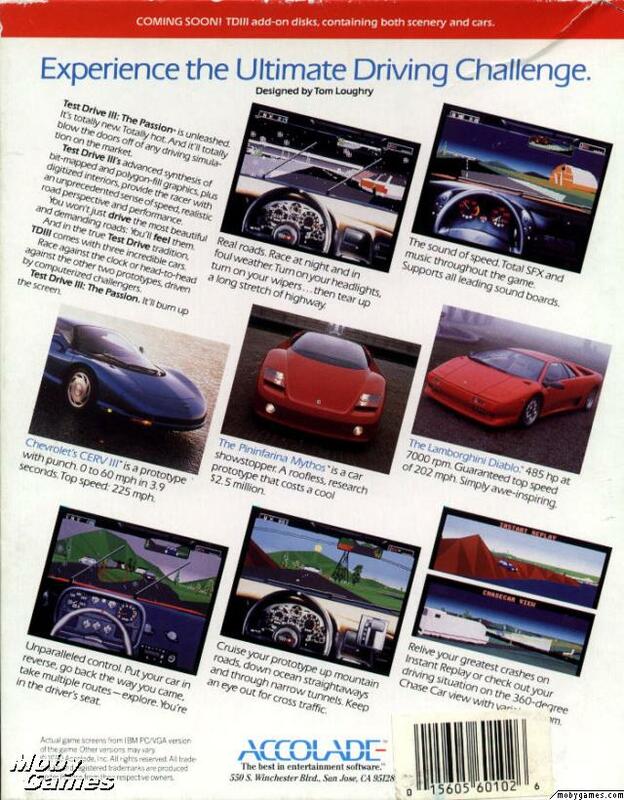 The only game that came close to offering similar experience was Spectrum Holobyte's primative Vette. Unfortunately the game is also very difficult to control, which might be explained by the fact that Test Drive III was developed in-house at Accolade instead of by Distinctive Software like the previous games. To play Test Drive III you'll need the DOSBox DOS emulator and the original game files which can be found here at Abandonia or here at EmuParadise. 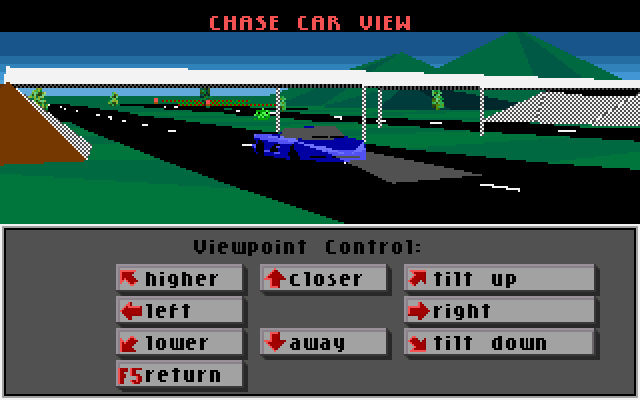 Mount the game in DOSBox by typing MOUNT C C:\OLDGAMES\TESTDRIVE3(the blue part should be the path to wherever you put the game folder on your HD) and then type C: to move to the folder you just mounted. Be sure to first run SETUP.EXE inside DOSbox, setting video to VGA/MCGA and sound to SoundBlaster/Adlib, and then run the game by typing TD3. 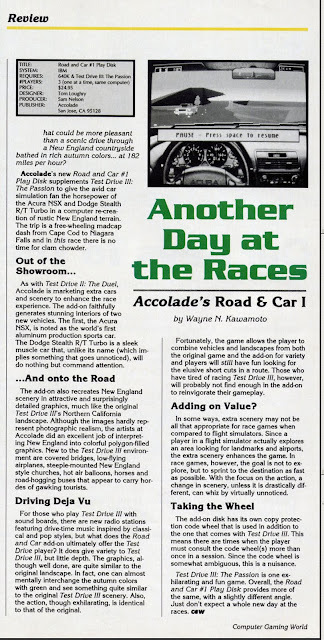 If you want to play with the add-on disk you should also mount it in DOSBox as an A drive by typing MOUNT A C:\OLDGAMES\ROAD&CAR (or wherever you put the add-on disk folder on your HD) and then select the A: drive in the game's track setup screen. The optimal DOSBox setting seems to be about 3500 cycles. The game is pretty simple to play. 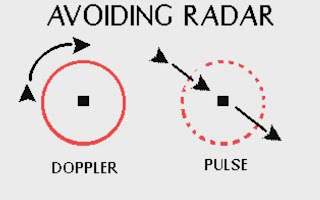 Just use the keyboard arrow keys to steer/accelerate and hit W for windshield wipers and M to change the music. While being fun in short bursts Test Drive III is a tough game to love even for a DOS geek. It pioneered the concept of a go-anywhere sandbox inside a living game world, but this world is so crudely represented that it can hurt the eyes. Also the steering control, seemingly designed for antiquated digital joysticks is amazingly awful for a driving game. On the plus side the music is catchy and sounds great when played through a Roland card, and the game is bug-free and much more playable than previous similar open-world drivers like Vette. 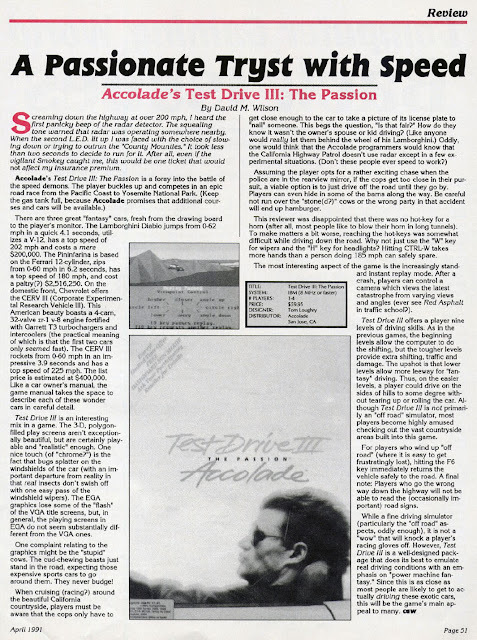 The DOS Scholar gives Test Drive III: The Passion two and-a-half out of four golden floppies. 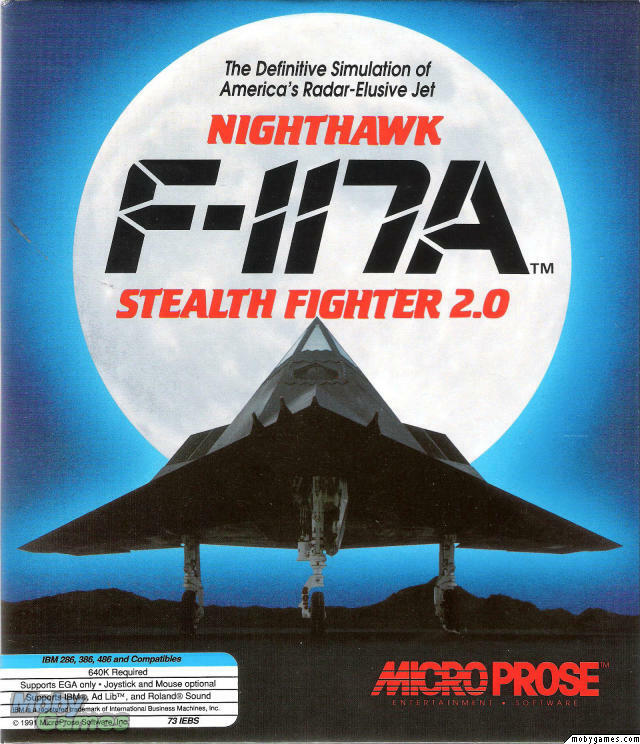 F-117A Stealth Fighter 2.0 is a combat flight sim released by Microprose in 1991. It's an "upgrade" of sorts of 1988's popular F-19 Stealth Fighter game, which was the first flight sim to tackle the mysterious stealth fighter. F-19 was released before anyone outside the US Air Force had even seen a stealth fighter, so that game's jet looked nothing like the real F117. 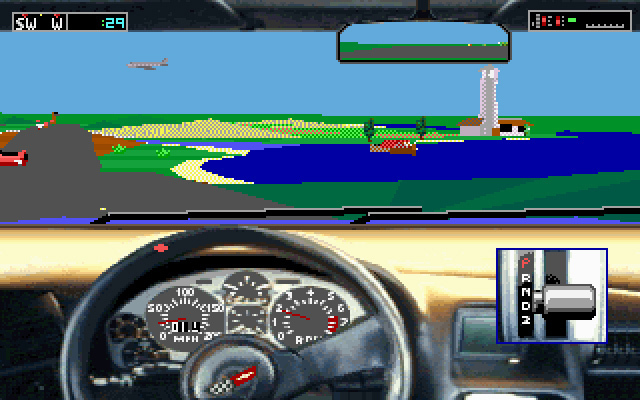 To play any classic DOS flightsim today you need three things: A cheap joystick, the DOSBox DOS emulator and the game files themselves which you can get here at Abandonia. 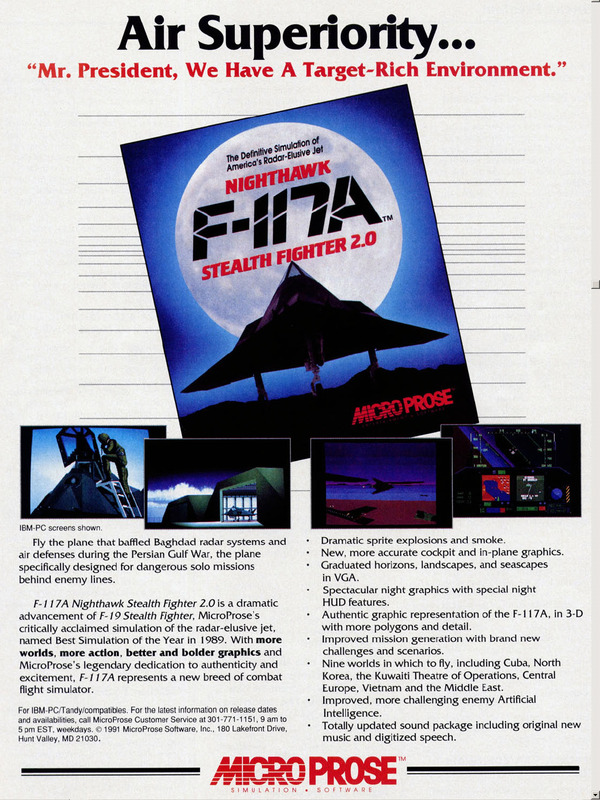 Also make sure to download the manual which is on Abandonia's F117A page. The optimal DOSBox setting seems to be about 5500 cycles. Keep in mind that the game was -designed- to play at a slightly choppy framerate. You don't want it too smooth because the game will play too fast and make landings and combat impossible. 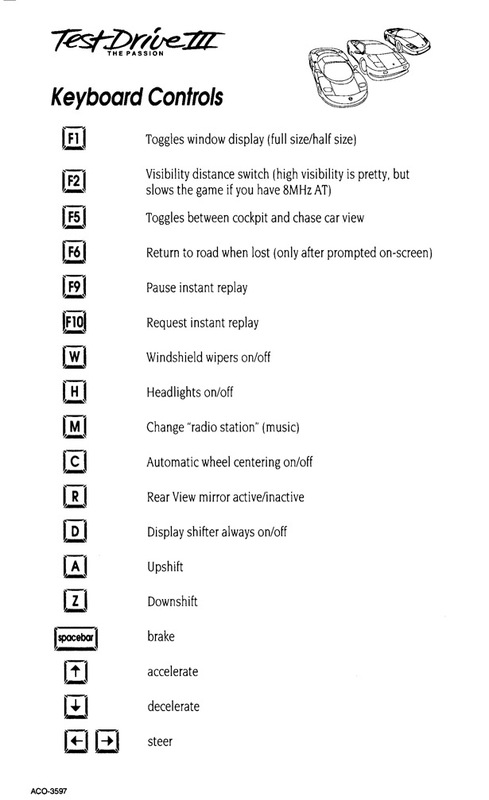 Run the game by mounting the game folder and typing "F117", and then select AdLib sound. So here's the F117A cockpit view. 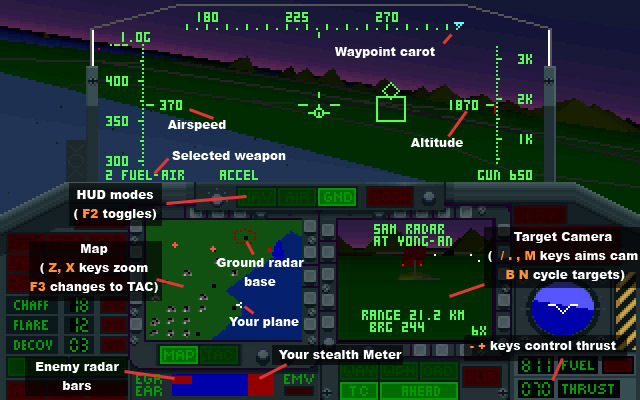 HUD modes: To target anything you need to first set your HUD to Ground or Air mode. You can cycle between Navagation, Air and Ground HUD modes with the F2 key. 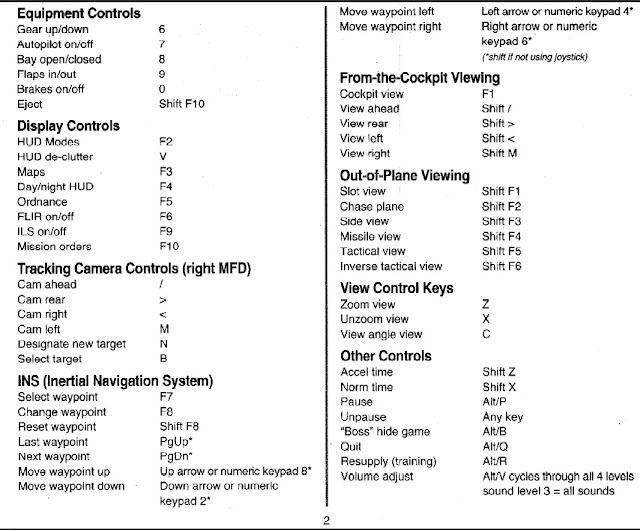 MAPS: The F3 key cycles the left MFD between the Mission Map which shows radar ranges, waypoints(F7 key) and the rough positions of enemy aircraft and the Tactical Map which shows a closer view of enemies and even missiles heading towards your plane. The Z and X keys zoom these maps. TARGET CAMERA: To attack any object in the game you first need to lock it up in the Target Camera, which you can aim in any direction with the / . , and M keys, and then cycle targets with the N and B keys. 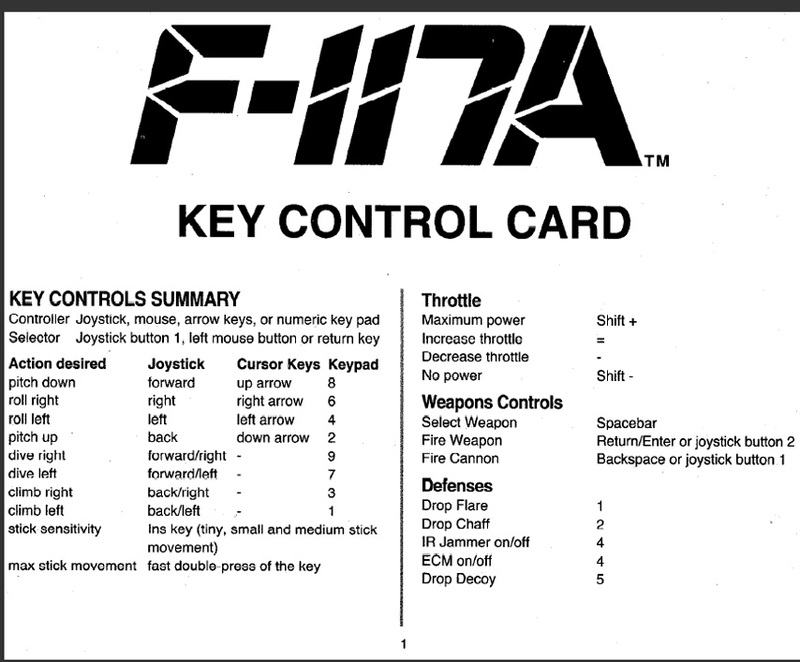 Also remember that spacebar cycles your current weapon and that you have to open your bomb bay doors with the 8 key before launching any weapon. 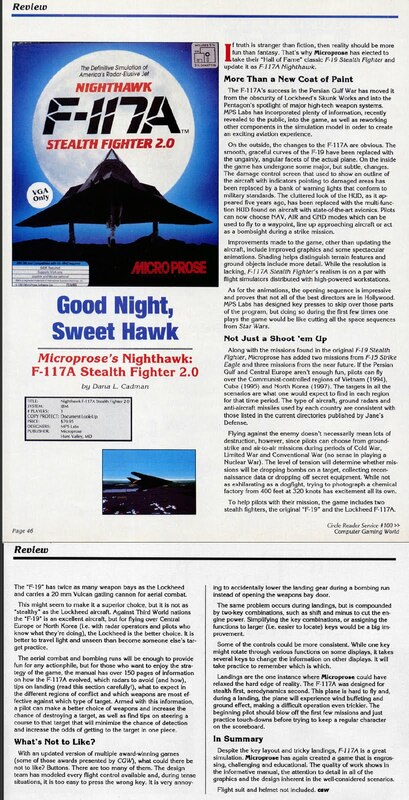 After playing through a couple missions I have to say that F117A has stood the test of time. 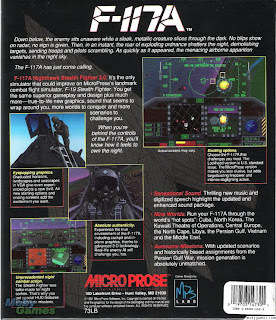 It remains a unique and strategically interesting game in it's genre; it's not just about blowing things up or twiddling knobs, its a STEALTH Combat Flight Simulator. 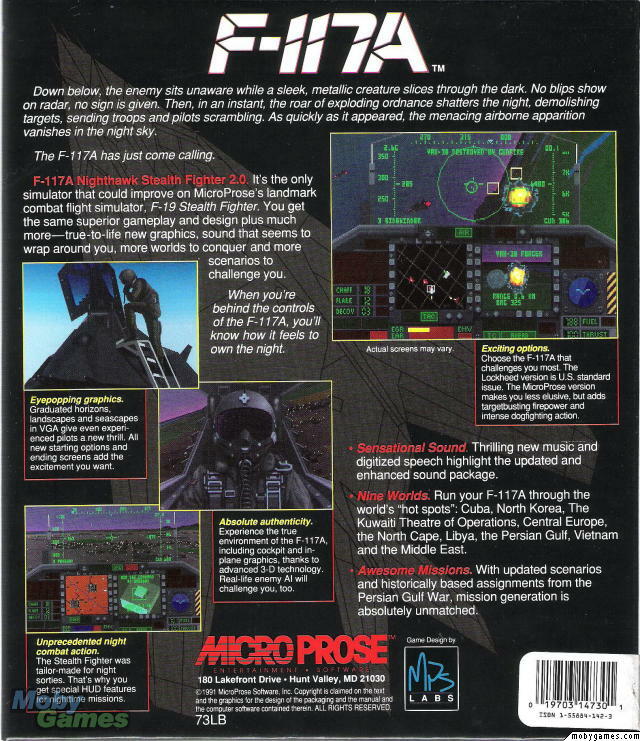 Also unlike later complex simulators F117A is a simple game to get into yet it still has the potential for deep strategic play. Sure the graphics are crude, but this doesn't really matter if you're interested in pure gameplay. You can almost think of it as a computerized boardgame with simple symbolic graphics. It's basic, but it's FUN. 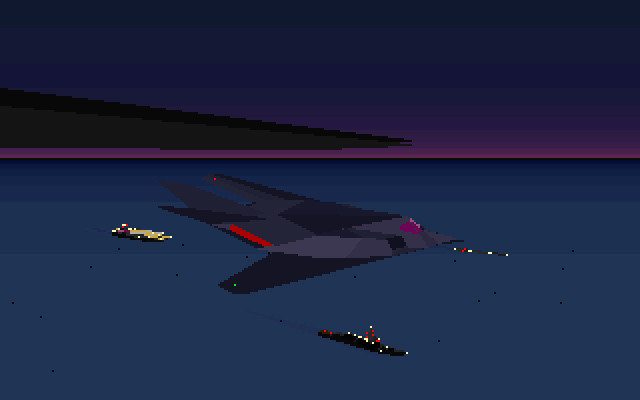 The DOS Scholar gives F117A Stealth Fighter 2.0 three out of four golden floppies.